The mistake everyone makes regarding the tropics is to presume that a large field was important. It was not and it is also extremely misleading. A family worked what we understand as a garden plot of perhaps one acre which was truly ample to their needs. Thus a mere 100 acres represents a community of 100 families or several hundred people which was typically too large. More realistically we had twenty to thirty such families representing 150 folk making up a natural community. The chicken is the real lifesaver because they will nicely toss a portion of the plot in several days removing all plant material and insects as well allowing actual planting. What was typically lacking was a way to organize society above this level and this forced villages to be wide apart. Thus true agriculture existed here but real social engineering was another matter. 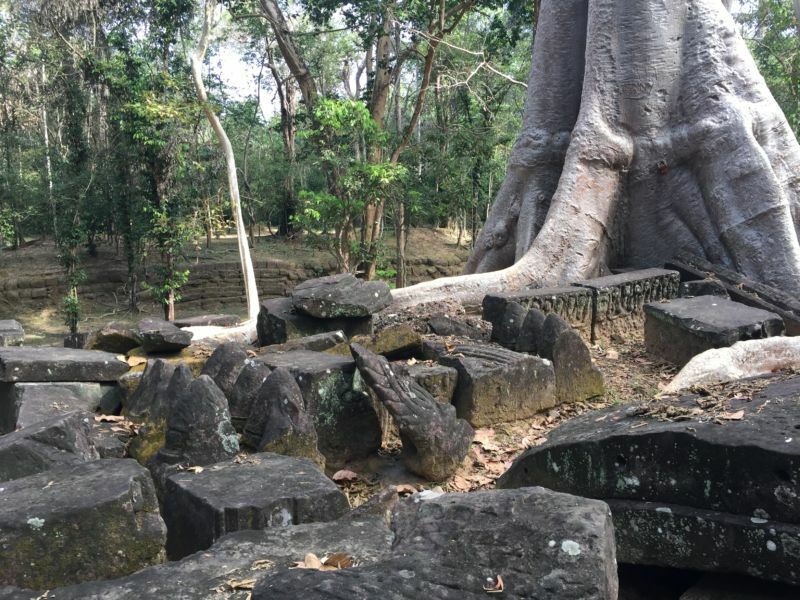 These are the relatively recent remains of an ancient temple in the tropical forest of Cambodia. It all started about 45,000 years ago. [ my date for our fall from EDEN - arclein ]At that point, people began burning down vegetation to make room for plant resources and homes. Over the next 35,000 years, the simple practice of burning back forest evolved. People mixed specialized soils for growing plants; they drained swamps for agriculture; they domesticated animals like chickens; and they farmed yam, taro, sweet potato, chili pepper, black pepper, mango, and bananas. NOTE: I changed the headline on this story because the previous headline, which said that farms were 30,000 years older than previously thought, was inaccurate. My apologies. I misunderstood that aspect of the original article in Nature Plants. What Roberts and his colleagues argue is that people were altering forests by burning and cultivating plants 45,000 years ago. This might qualify as proto-agriculture, but it is not farming (that's the part I misunderstood). The headline and article now reflect a more accurate description of the original research.